Online polite negative opinions can help boost sales, researchers reported in the Journal of Consumer Research. Reading online customer reviews is a convenient way to obtain authentic accounts of other consumers’ opinions regarding a product. The study found that negative feedback that is offset by a politeness factor may help sell an item. The research team carried out a series of five experiments to determine whether including a marker of politeness in a negative product feedback (review) influences the image of both the product being reviewed and the reviewer. Polite negative opinions may encourage people to pay a higher price. The authors found that participants who had read the description with the marker of politeness were willing to pay more for the watch – $136 instead of $95. Participants were also asked to complete a survey which evaluated the “personality” of the brand. 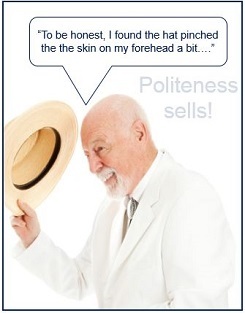 According to participants’ responses, it was found that products associated with markers of politeness were seen as more wholesome, down-to-earth, cheerful and honest, compared to those with no polite customer complaint.